Mobsters. Big hair. The smelly Turnpike. The poor cousin of its glittering neighbor Manhattan. Could that really be all there is to New Jersey? 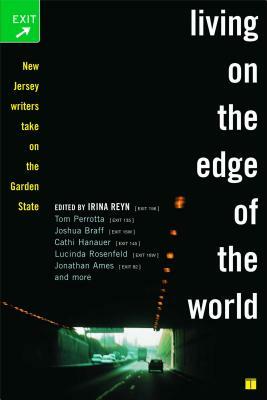 In Living on the Edge of the World, the best and brightest young writers from the much maligned state answer back with edgy, irreverent pieces of nonfiction paying tribute to New Jersey's unique place in the cultural consciousness. Like a drive along the Garden State Parkway, their stories travel to just about every corner of the state, from Princeton and Hillside to Camden and Hoboken. In "Straight Outta Garwood," Tom Perrotta writes of the near inescapability of returning to his home state again and again in his novels; in "Exit 15W," Joshua Braff tells how all roads led back to the Jersey Girl he'd fallen for as a seventh-grader; Kathleen DeMarco takes a nostalgic look at her grandfather's cranberry bog in "The Family Farm"; Jonathan Ames recounts a failed attempt to consummate his flirtation with a boardwalk beauty in "Rose of the Jersey Shore"; and Frederick Reiken offers an elegy to a high-rise in Fort Lee that opens his eyes to a new, dangerous world. A celebration of all that's weird and wonderful about the Garden State -- including Bruce Springsteen, the Nets, the Jersey Devil, the films of Kevin Smith, and Great Adventure -- Living on the Edge of the World will have New Jerseyans everywhere ready to stand and be counted. "This collection proves that you can go home again, because when you are from New Jersey, you never really leave." -- Mark Sceurman, Weird N.J.
"This funny, wistful, and appealingly oddball book covers more ground in New Jersey than the Turnpike. It's a fitting tribute to my beloved -- and deeply misunderstood -- home state."